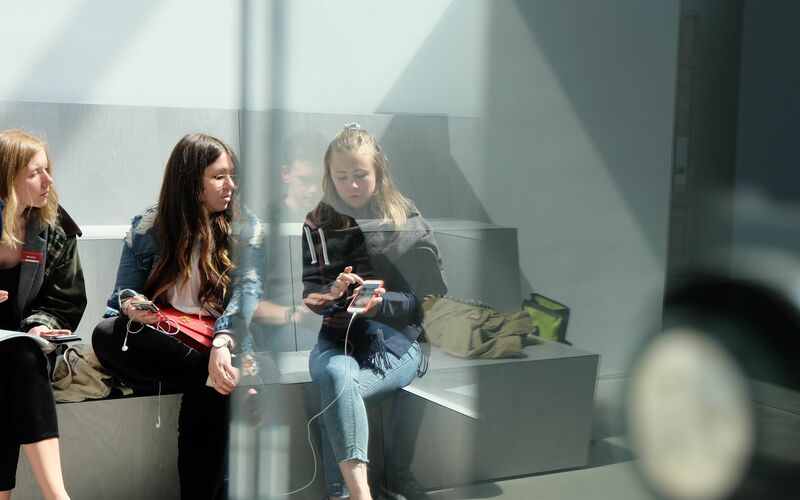 Thanks to an innovative digital strategy, the Kunsthalle Mannheim is opening up new scope for participation and interactivity. Operated via a central Museum Orchestration Server (MOS), real and virtual museum spheres can now interactively overlap. Alongside the analogue Kunsthalle as an experiential space, enter the Kunsthalle 4.0 – accessible worldwide and open 24/7. Providing cultural education, liberating visitors from the controlling authority of the museum, and appealing to new kinds of audiences lie at the heart of this digital “revolution.” The goal is not simply to achieve technical functionality, but rather to sharpen and stimulate the senses and perceptions of visitors via digital means, and guide them towards the real target: an individually enriching contemplation of the original artwork and the opportunity to share this authentic experience with others. 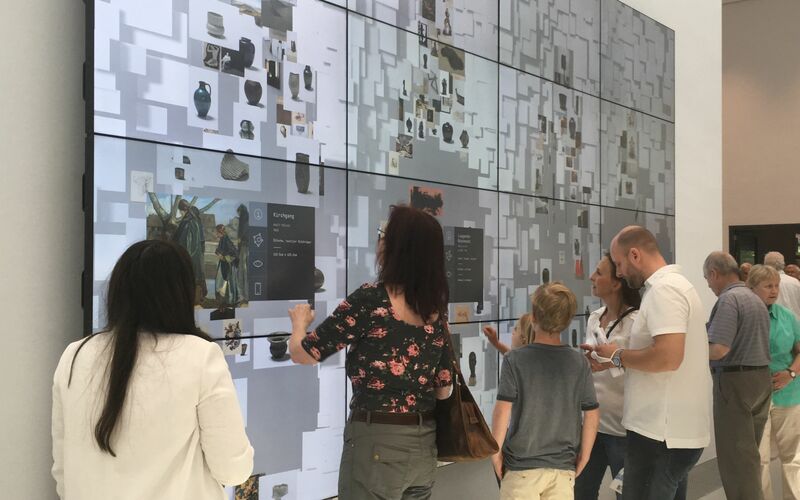 The interplay of digital tools inside and outside the museum consolidates the educational experience in a kind of “cross-mapping” of various kinds of media, and creates whole new worlds of discovery. 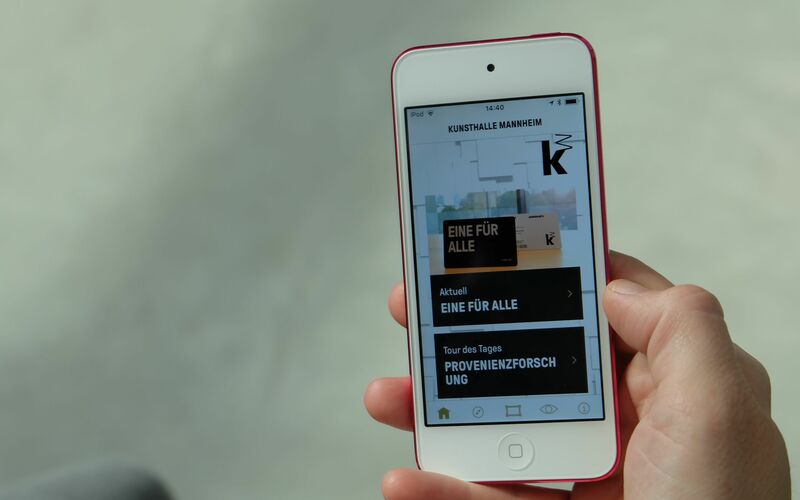 Kunsthalle Mannheim App is a multimedia accompaniment to your visit to the Kunsthalle, with tours and information on exhibitions, artworks, and events. Download it for free via the Apple App Store or Google Play Store. 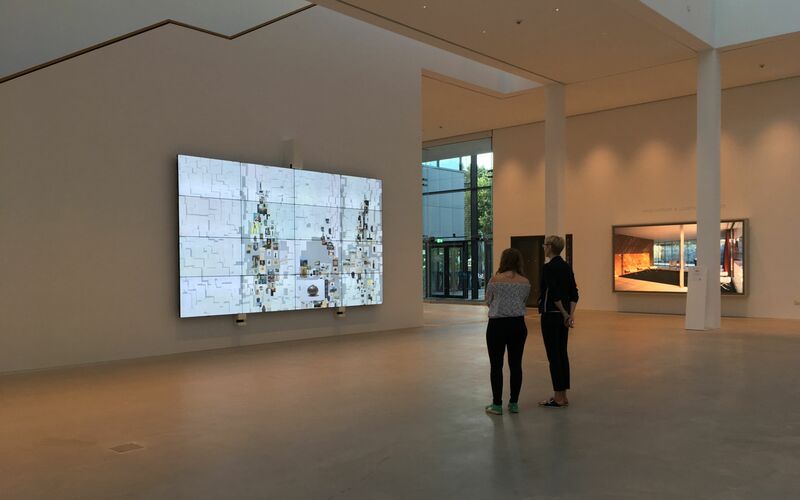 Collection Wall: The billboard-sized projection surface in the atrium (accessible to the public free of charge) presents the contents of Kunsthalle’s growing digital collection. This extravagant visualization invites the visitor to interact: Images can be moved around and selected with a wave of a finger. Further information on the exhibited works can be accessed via the KuMA-App. The Creative Lab invites visitors to find out more about the sculpture collection, offering experimental multimedia presentation formats (virtual reality, augmented reality, 3-D modelling). The digital laboratory is linked to research and learning, and is open for new ideas and innovative technologies. Personal Museum Catalog: A terminal with layout and text templates allows visitors to design a catalog with their personal favorites from the collection according to their own imaginations and ideas, which can be taken home, printed out, and given to friends and loved ones as gifts. Graphics Table The graphic collection is the largest of the Kunsthalle’s collections, comprising over 33,000 works. 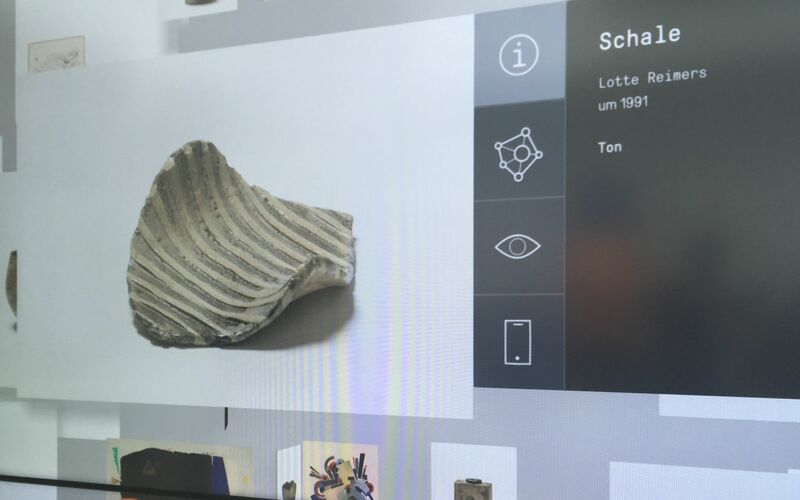 Items from the collection can be placed under the microscope and examined via a high-resolution touchscreen display. Details of the techniques applied and the artist’s handwriting become visible. The Museum Orchestration Server (MOS) is the “brain” of the digital strategy. It connects and steers the digital tools and is the interface for the museum’s database, and with its help the research team maintain and edit all content relating to the museum. The MOS updates itself every night, so that everything is up-to-date the following day. Young and Hungry for Art? 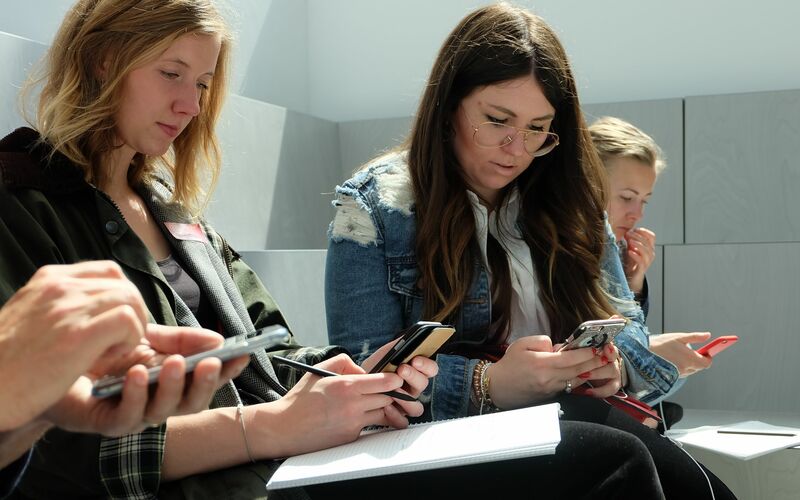 ARTgenossen enables all 20 to 35-year-olds the chance to gain multifaceted insights into the Kunsthalle Mannheim and cultural activity throughout the region. With our newsletter you will receive regular updates about our exhibitions, program, events, and digital offerings. Hunt for treasures in our online collection and discover masterpieces from across the collection.